We recently shared some great resources for planning your next trip to Gettysburg, but we also realize just how difficult it can be to get a moment to sit down and plan a family trip. So here are some of the great events happening in Gettysburg this spring, a quick list that you can build your itinerary from if you’re limited on time (and who isn’t?). WWII in Gettysburg (Weekends in March through June) – This two-hour tour quickly become a guest favorite in 2017, so we brought it back for 2018! Come see a different side of Gettysburg, with a look at the people and places that played a part in World War II. You will visit a prisoner-of-war camp and learn why an intelligence camp was located here, training specialized troops for psychological warfare. Gettysburg Area Recreation Authority Outbound Day Trips (March 17, May 5, June 2, September 22, December 1) – Each year we partner with the Gettysburg Area Recreation Authority on some great outbound day trips to nearby locations. If you want to experience more than just Gettysburg, these day trips include stops at the Sands Casino in Bethlehem; Springfest in Ocean City, Maryland; a day in New York City; and Sunfest in Ocean City, Maryland. Living History Weekends (Weekends in April through October) – Another guest favorite, these living history weekends bring stories from Gettysburg to life. Civil War living historians camp out on the Gettysburg Battlefield each weekend so guests can interact, learn about their tools, tactics and firepower, and more. Each weekend brings you a different topic, so multiple visits are encouraged! 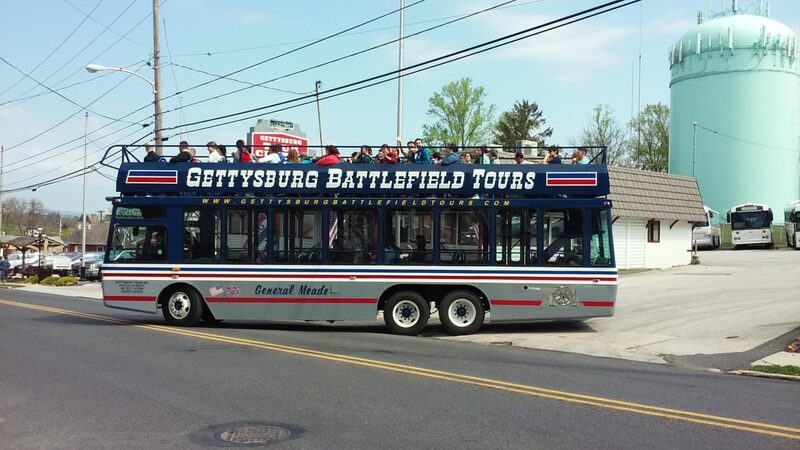 World Famous Double Decker Tours (Starting April 21) – A classic sign that spring has sprung in Gettysburg, the double decker tours begin early spring and run all summer long. Relive the Battle of Gettysburg, as told by the most knowledgeable historic storytellers in the area (weather permitting). Gettysburg North-South Marathon (April 22) – For the more active guest, the Gettysburg North-South Marathon is something you won’t want to miss. Come run against the setting of a landmark battle of the Civil War. A unique twist is that runners from the North are pitted against runners from the South in this scored competition. If a full marathon is not for you, it’s OK – there’s also a half marathon and a 5K. Doors Open (May 5) – As part of National Historic Preservation Month, Gettysburg joins the national and international movement to offer a look at some of the amazing historic buildings and places that are rich with history. Get an insider’s look at how the Gettysburg National Military Park works to preserve some of the many magnificent, historic buildings we have here in Gettysburg. Gettysburg Bluegrass Festival (May 17-20 & August 16-19) – This event is so popular, we get to do it twice! The internationally-acclaimed, multi-day music festival is held at Granite Hill Camping Resort each year and lasts for several days. If you enjoy bluegrass, don’t miss seeing dozens of artists who put on quite the performance here in Gettysburg. Gettysburg Outdoor Antique Show (May 19 & September 22) – Who doesn’t love a good antique show? This semi-annual event attracts more than 120 antique dealers and is held rain or shine. Proceeds benefit community activities of the Gettysburg Area Retail Merchants Association. Gettysburg Memorial Day Parade (May 28) – Come honor and remember the great men and women who died while serving our country. The annual Gettysburg Memorial Day parade and ceremony is one of the oldest continuing ceremonies in the U.S.A.
155th Anniversary of the Battle of Gettysburg (July 5-8) – We know this isn’t part of spring, but it’s a great kick-off to our summer season. One of the most popular events each year is the annual Civil War Battle of Gettysburg reenactment. The weekend is packed with events designed to bring history to life for guests of all ages. As you can see, there’s something for everyone this spring in Gettysburg. Which event are you most looking forward to? Posted in Blog, Interesting History, The Civil War, Things To Do and See and tagged gettysburg area recreation authority, Marathon, national historic preservation month, sands casion, WWII on March 21, 2018 by Gettysburg Battlefield Tours.